As mentioned here we’re conducting an auction on behalf of Help for Heroes this coming weekend, 15th-17th October. Bidding on this auction will be a little different to usual – so watch out! Until Monday morning, bidding is ‘blind’ – no-one will be able to see what others have bid. Instead you will be able enter a single maximum amount you’re prepared to pay for each lot via a special form (much quicker than normal bidding – we hope to roll the feature out more generally in the near future) and then submit all your bids at once. Bids placed at this point are final, and, whilst you can enter new, higher bids, you can’t reduce or remove a bid. If you’re the high bidder, sit tight and keep an eye on the auction throughout the day. We will of course let you know if you’re outbid. If you’re not winning when the auctions start you can bid in the normal way to increase your bid. When the auction closes we’ll let you know whether you’re the winning bidder. All auctions in this sale will close at the same time though – so we advise entering a single, maximum bid early in the day and leaving it to the site software to bid on your behalf as the auctions close. Good luck – and remember your bids are for an excellent cause. We’ve been quiet on the blog front (preparing for the Fine Wine Fair and organising various forthcoming sales has been taking up all our time). However I wanted to share a couple of notes on some wines which are coming up for sale shortly. Both are Australian Shiraz but are as far removed from the common perception of this wine as one could imagine. Indeed they share far more in common with Syrah from the Northern Rhone or the Languedoc. A fine selection of wines including a large collection of 2005 Bordeaux in OWC consigned to sale by a fastidious private seller, all offered on a ‘no reserve’ basis. Stars lots include 2005 Leoville Las Cases, 2005 La Conseillante 2005 Calon Segur. Also in the sale will be a horizontal of 1996 1st Growths (Latour, Lafite Rothschild, Margaux and Mouton Rothschild) plus a range of mature wines from Australia. Please contact us if you would like to discuss including your own wines in one of our sales or why not request a valuation? We’re pleased to announce a significant change in strategy for Bid for Wine with the launch of a series of regular large sales. The first, a sale of top end Burgundy including multiple vintages of Ponsot Clos de La Roche, Rousseau Chambertin & wines from Comtes de Vogue commenced on Friday 21st May. Auctions will be closing from 9AM onwards on 28th May. The new approach will build on our consignment service run from EHD London in Weybridge. This is a full auction service including valuation, photography and collection of wines prior to sale. Until now, when wines were consigned to us for sale, they were normally listed and put up for sale immediately in amongst our standard ‘peer to peer’ auctions. Whilst this works perfectly for odd bottles, increasingly we’re being asked to handle large collections by consignment which requires a different approach. For example the client normally doesn’t want any direct involvement in the sale and the wines need to be visible for longer than simply just the 7 days of a sale. Going forward we’re going to be focussing on doing larger sales of consigned lots every few weeks. Potential bidders will be able to browse lots for several weeks prior to the sale, either via downloadable catalogues or on the site whilst sellers will benefit from having their wines advertised via routes such as The Saleroom. Lots in the Burgundy sale can be viewed here. If you are interested in having your wines valued, why not send us a list (see here) or give us a call on 0207 183 3985? 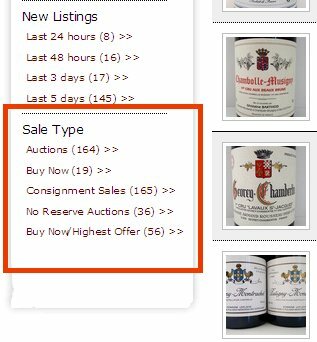 If you’re only interested in wines which are sold on consignment or are listed with no reserve price, you can now find them quickly and easily via the facetted navigation on the left of the auction page.